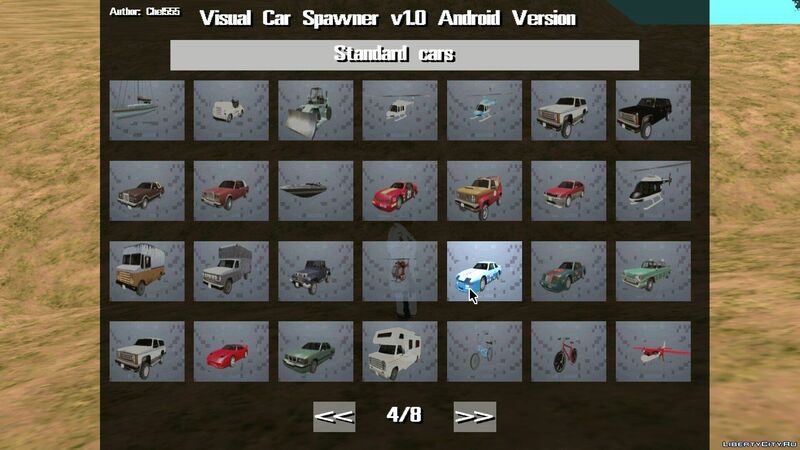 Visual Car Spawner, now ported to android! Cursor control: 2 - left, 6 - right, 4 - up, 8 - down, 5 - click, select. Спасибо за "ответ" и за "замечательную" инструкцию, итог либо этот мод просто не рабочая фигня,либо я что то не так делаю а что именно хз,я просто в шоке с людей, которым в падлу написать нормальную инструкцию по использованию, 4+9 да где? Где я возьму эти 4+9 мне фломастером на экране самому чтоли написать??? I like to download and install, but I do not have icons in this fashion on the machines when I choose them! zhekuhe , On the screen the zone is divided into 9 areas. I do not exactly remember, but the first three areas from left to right are 1, 2, 3. Try it. Clamp simultaneously in two areas of the screen. For example, 3 and 9. Then the script itself is activated. Thanks for the "answer" and for the "wonderful" instruction, the result is either this mod is simply not working garbage, or I'm doing something wrong and what exactly is xs, I'm just shocked by people who write bad instructions for use in padloo, 4 9 where? Where I will take these 4 + 9 to me a felt-tip pen on the screen most chtoli write ? ?